(OTTAWA, ONT.) 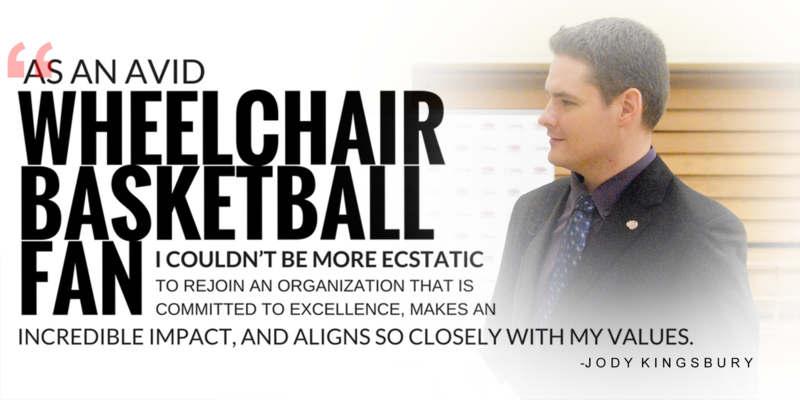 Wheelchair Basketball Canada is pleased to welcome back Jody Kingsbury to the organization as he takes on the new role of Director of Marketing and Communications effective as of July 9, 2018. Kingsbury will oversee the WBC marketing and communications department, with a particular emphasis on enhancing brand and marketing initiatives and building strong and meaningful relationships with current and prospective corporate partners. Kingsbury brings a wealth of knowledge to his new role in the areas of communications, marketing, branding, storytelling, digital media and media and public relations, in addition to multiple experiences in various support team capacities at the IWBF World Championships, Parapan American Games and Paralympic Games. This will be Kingsbury’s second stint with the organization after previously serving as the Manager of Marketing and Communications at WBC for seven years. He moved on to a managerial role in athlete marketing and alumni relations with the Canadian Paralympic Committee in 2015. Kingsbury will be based at the WBC national office in Ottawa and can be reached at jkingsbury@wheelchairbasketball.ca as of July 9, 2018. Wheelchair Basketball Canada is the national sports governing body responsible for the organization of the sport in Canada. It is a non-profit, charitable organization that is committed to excellence in the development, support and promotion of wheelchair basketball programs and services for all Canadians from grassroots to high performance. Wheelchair basketball is a fast-paced, hard-hitting, competitive sport in which Canada is held in high esteem around the world for winning a combined six gold, one silver, and one bronze medal in the last seven Paralympic Games. For more information visit www.wheelchairbasketball.ca.